Jobs here should have a "Singapore first" label: employers should be allowed to hire foreigners only if they show there are no deserving citizens to fill the vacancies. That is one of five recommendations made by Tan Khee Giap of the Lee Kuan Yew School of Public Policy to help resolve income disparity and the labour market failure in Singapore. "Singaporeans should have the first bite of the cherry when it comes to jobs here," said Dr Tan, co-director of the Asia Competitiveness Institute. This model should be incorporated into the work permit application process which should inquire whether locals had been sought first. This would help create more jobs for Singaporeans and raise wages in Singapore, which have been depressed by lower-cost foreign labour, he added. This "Singaporean first" jobs policy will help rationalise the workforce to correct the labour market structure, improve labour market efficiency and raise the wage-GDP ratio. "The government wants to drive productivity up but since we are still talking about it after so long shows that we have a classic labour market failure here to drive up productivity," Dr Tan said. His other solutions to these problems involve more proactive and targeted skill matching and upgrading; changing public policy philosophies to pursue a more optimal, inclusive and balanced growth model; redefining key performance indicators, strengthening policy mechanisms and financial budget allocations of government agencies; and continuing to sharpen Singapore's international competitive edge while plugging further into the globalisation of trade and finance. "Globalisation is not wrong - that is the only way to maintain a first-world standard of living," Dr Tan said. These factors will help avoid an economic underclass from being prominent in Singapore, he added. But he agreed that it would be necessary to focus on social mobility factors so as to avoid a situation where a permanent underclass develops in Singapore. Explaining the difference between the two, Dr Tan said: "The economic underclass is due to economic reasons. But permanent underclass means that even if the economy recovers, people still cannot get out of it due to the structure (of society). At the moment, I tend to think that we are only at the economic underclass stage, not at the permanent underclass stage yet." In this regard, he argues that it is important that the non-level playing field in education be levelled, specifically when it comes to pre-school education. He elaborated that the private market in this sector has created price extremes. "We should make pre- school education part of the overall education of the government so that the children of the poor can learn computer and other skills in pre-school too," Dr Tan told BT on the sidelines of the Singapore conference of the Pacific Economic Cooperation Council (PECC), where he also serves as the chair of the Singapore National Committee. He argued that his recommendations would be more effective than a minimum-wage policy in reducing income disparity here. "I am against a minimum wage. 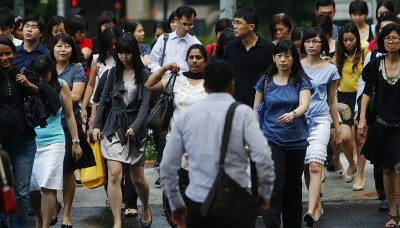 The problem is that once it is implemented, you cannot discriminate against non-Singaporeans. So you will have to pay foreign workers a higher salary when they are actually prepared to accept a lower wage."